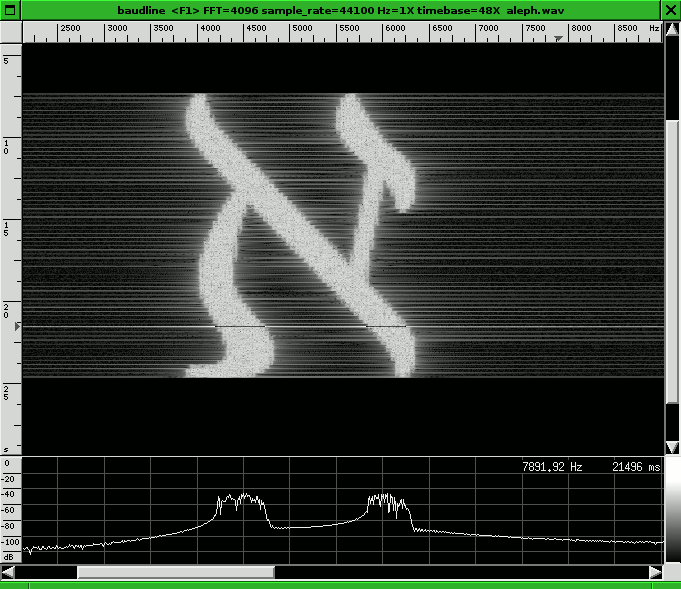 Alcaze is a "bitmap to spectrogram" converter. 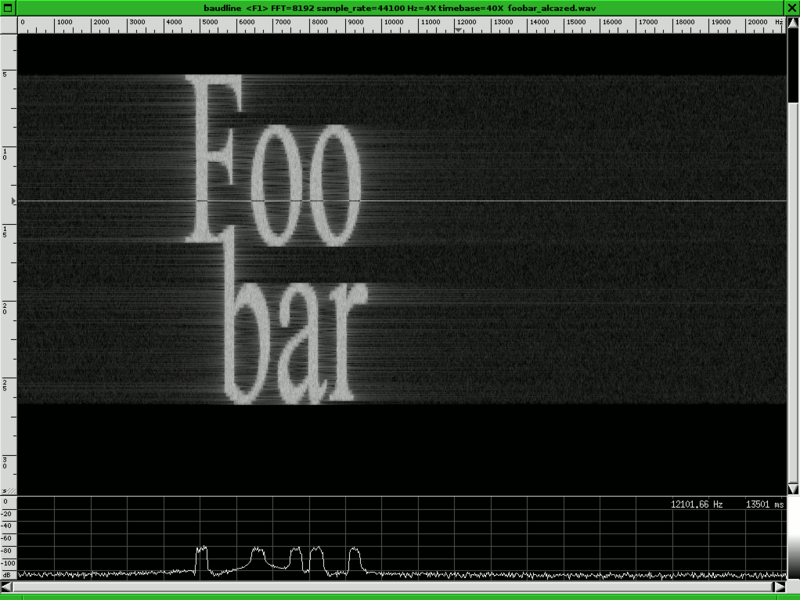 A program that takes a bitmap image as input and produces an audio signal as output, so that the signal spectrogram shows an approximation of the original image. It's a very simple command-line program that should compile and run on many Unix and non-Unix systems; it's released under the GNU General Public License. Alcaze works this way. Let's assume you have a bitmap with n pixel columns and m pixel rows, and want to display it in a target frequency band between f0 and f1. The program generates n similar signals which contain only white noise from 0 Hz to some (small) frequency value f. Then each signal is resampled at 44100 Hz and translated up in frequency, so that the whole signal array covers the target frequency band. 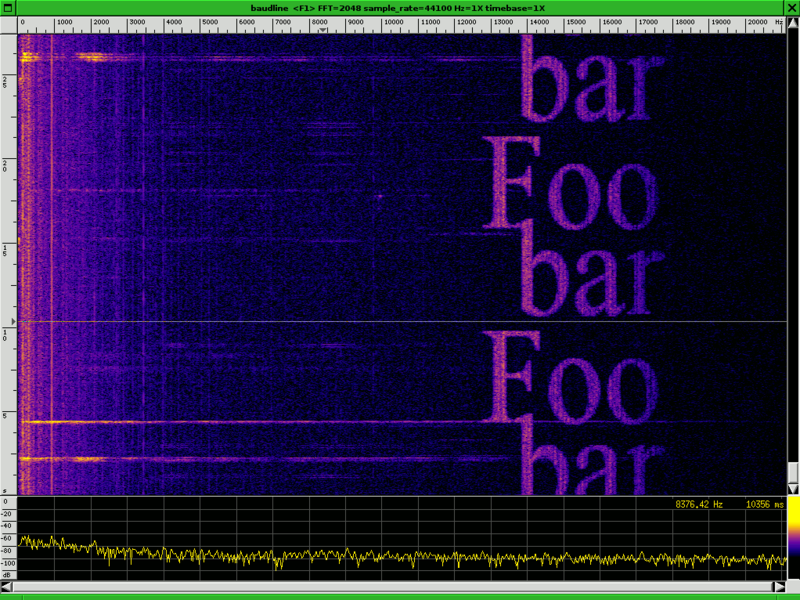 At this point the target band is covered by n independent sub-bands of white noise. Alcaze then time-modulates each signal by multiplying it with the pixel values from the corresponding column. Finally the resulting signals are added together, and the sum is the output. This solution works quite well but it must be improved and I don't like it very much. Also I think there are different ways to do the thing; maybe I'll code them when I'm inspired enough. Like you may have guessed, I wrote Alcaze as an experiment with software dsp, especially signal resampling, bandpassing and upconversion. I then quickly realized that it could be used in funny and interesting ways. If someone is recording audio with a microphone and showing its spectrogram in realtime, playing a sound generated by Alcaze will make the bitmap show up in the spectrogram. A signal produced by Alcaze could be transmitted by a radio equipment, and would appear to anyone with a spectrum analyzer (I think this trick is used commonly in the world of amateur radio). You may convert a bitmap to a high frequency signal (for example between 14 and 18 kHz) and mix it with another sound file, for example a music mp3 file. Most people won't notice the hidden signal, and you have a sort of simple steganographic channel. 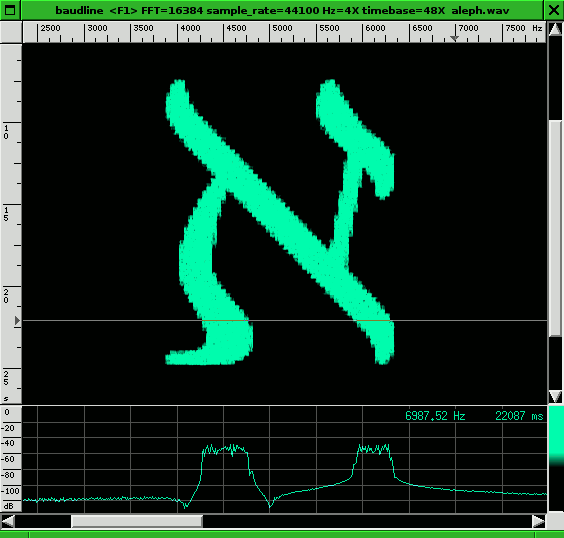 The following pictures show what Alcaze does: on the left is the original bitmap, on the right various spectrograms of the output signals (I used baudline as a spectrum analyzer). Note how the result varies with different settings of the spectrogram software, especially color aperture, time/frequency scale and stft window. 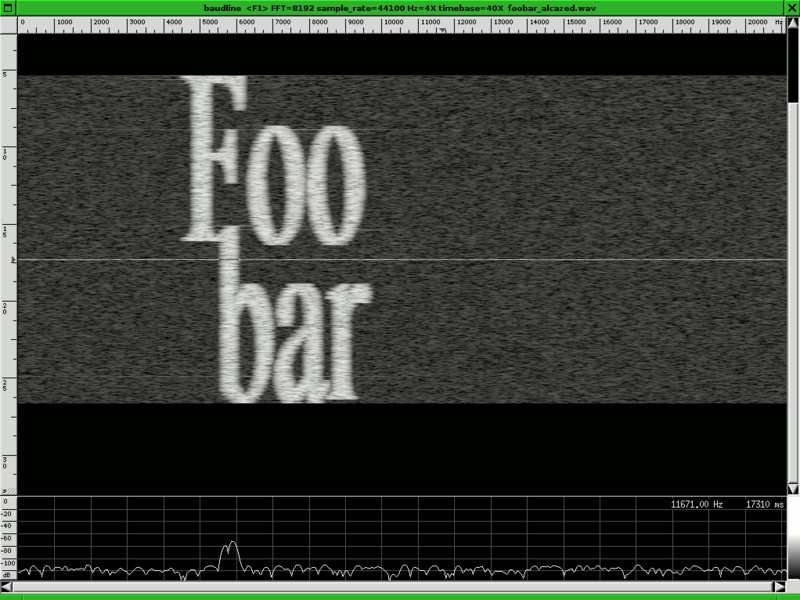 Also note the spurious wideband noise and the spikes generated by the sudden changes in pixel values. Here's what you get when you set a sound to loop from the speakers and then record with baudline from another computer in the same room. Voice and pictures mix up! Finally, in case you are wondering what Alcaze means... Nothing; that word came out while I was trying to remember the name of another program, and I liked the sound.